When we had made our original plans for his trip, we'd planned to visit friends in New Jeraey on Sunday evening. But that fell through, and we hadn't really replanned for that gap. 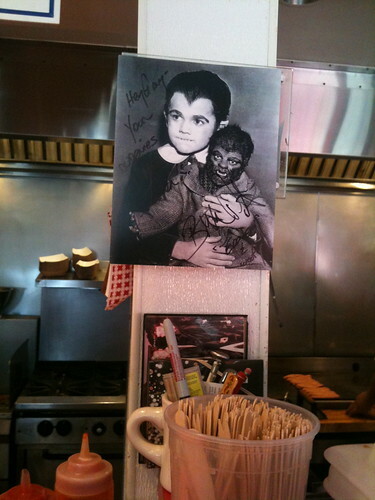 When we planned in Pepe's, I had been idly considering going to Meatopia in New York City. Lori pointed out, however, that when we had been to Northampton previously, the yarn store that she had listed as one of her craved New England destinations had been closed for July 4, so she hoped to visit there again before we left New England. So we planned to wend our way through Connecticut to Northhampton, visit the yarn store in the morning, and make a long drive home on Monday. So, where to eat in New Haven before we set off? Chris Ayers had recommended Rawley's for superior hot dogs, but their answering machine said they were closed on Sunday. Louis Lunch has historical significance with this claim to being the origin of the hamburger, but their phone didn't answer. 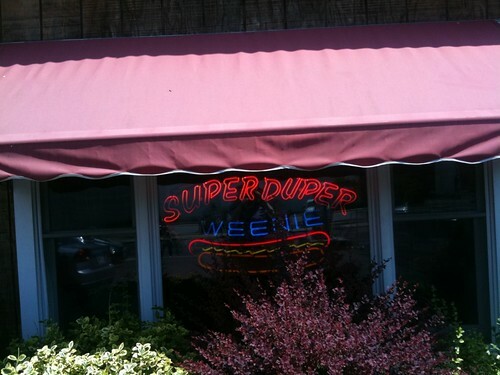 So we headed towards Super Duper Weenie. 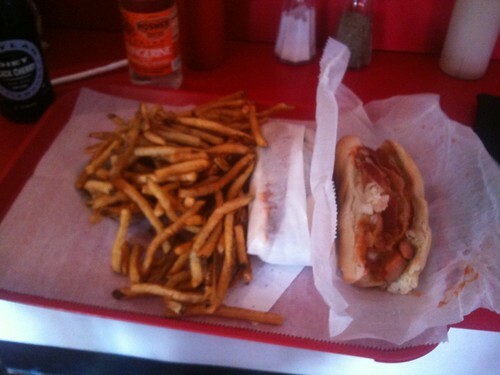 We both had the New Englander hot dog, with sauerkraut, bacon, mustard, relish, and cole slaw. It was pretty good, but we weren't blown away. 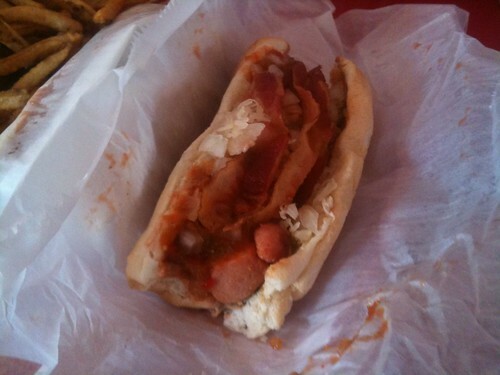 I felt that it would have improved the hot dog for the bacon to be much crisper, or cut into smaller pieces; it was hard to bite through the bacon neatly. We also got an order of fries; one order of fries provided a whole lot of thin, crisp little fries. 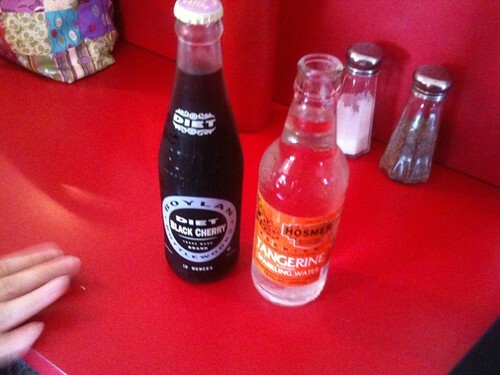 Along with my meal, I got a bottle of Hosmer Mountain Tangerine Sparkling Water. (Hosmer Mountain is a Connecticut-local Roadfood-listed bottler.) I liked this quite a lot, because it was tart and refreshing, but not sweet at all. Lori made a face at it because it was not sweet at all.